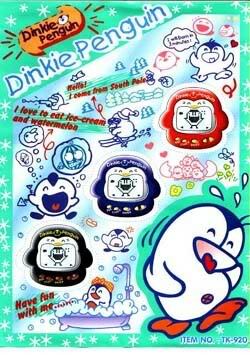 This is a Yuki Pengin, also known as a Dinkie Penguin. Apparently "yuki" means "snow". I presume it is by the same company who made Dinkie Dinos because they are almost exactly the same, except it's a different animal. 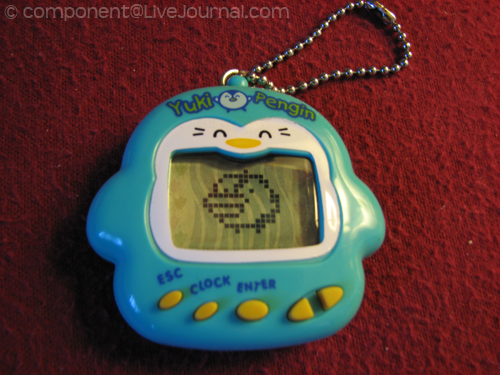 It is a generic virtual pet that appeared on the market around the time the vintage Tamagotchis were released. This is one of my newer additions to my collection. The characters are way cute! The foods are a little more different than on the Dinkie Dino, but not much has changed. I like the outer shell design. The penguin shape is adorable ^_^ I also like the colors it comes in. These are hard to find sometimes. I would give it a 9.5 out of 10 just like the Dinkie Dino since it also lacks a pause feature, but everything else on it is awesome. I got mine for about $10 I think :D It was pretty inexpensive, that's all I remember really. They seem a little more rare than the Dinkie Dinos, so you may have a little trouble finding one, and then if you do it might be going for a lot because some sellers think you will buy anything for any price. Just hold out until you find a cheap one is what I say :) You might not find the color you like, but it is an excellent virtual pet to own, regardless. Right now they seem to be going for $20-50, which isn't too bad. If you are careful you could get a nice used one for $20. Just make sure to ask the seller to send a picture of the pet in functioning order before you buy any used pet. And I would not recommend buying a really rare virtual pet if it is used because you might get ripped off.